Clark the Carver of Carve Me A Bear! Chainsaw Carvings is a master sculpture. Having over 30 years of experience applying his trade, he creates a number of wood carvings with his trusty chainsaw and phenomenal talents. 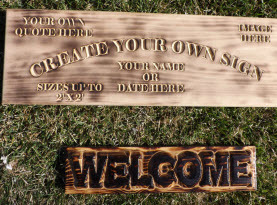 We have many carvings ready for sale as well as accept custom orders. 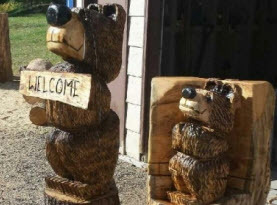 Specializing in a wide range of animals including: Bears, Dogs, Birds, Horses, Moose, Owls, Coyote, Wolves, Bunnies, Squirrels, Lions, Raccoons, Chickens, Pigs, Eagles, and so much more, we also carve Mascots, Garden Wizards, Mountain Men, Cowboys, Indians, Tiki and Totem Poles, as well as Custom Furniture such as: Benches and Tables, Custom Order Signs, Mantels, Flower pots, Memorial Planters an so much more! Carve Me A Bear! 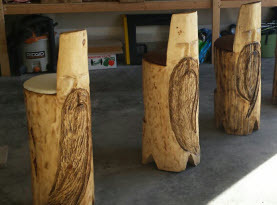 Chainsaw Carvings also transforms the stump in your landscape into a remarkable piece of art. Carve Me A Bear! Chainsaw Carvings loves chainsaw carving owls. Many people adore owls. With the wisdom, grace and adorable features, many folks find their attraction to owls and want to collect an assortment of owl trinkets, art, and sculptures. With Carve Me A Bear! Chainsaw Carvings, we can offer the owl enthusiast a unique and one of kind owl chainsaw carving crafted by the gifted Clark the Carver. Owls are nocturnal, being more active at night. With over 200 different species of owls, it’s hard to find one that doesn’t make you intrigued with their mystic. Most owls will hunt a number of insects, small mammals and other birds while some species even hunt for fish. With their strong talons, they can catch and kill their prey quite effectively. Distinct large eyes and flat faces, most folks can spot an owl pretty easily. Owls have the awesome capability of turning their heads 270 degrees, but have the disadvantage of being farsighted. Their binocular vision is an asset during hunting activities, but if they want a close inspection on various things, it isn’t very clear. Though their calls can be projected at high volumes, their flight is exceptionally quieter than other birds, increasing their hunting capabilities. An owl’s defense while they slumber in the daylight is contributed to their feathers, as the coloring allows camouflage, blending into their environments. Owls are found in most regions of the earth. Antarctica and some remote islands being the exception. There are some species more common to people that tend to capture hearts around the world. They include the following common owl species: Great Horned Owl, Barn Owl, Snowy Owl, Barred Owl, Burrowing Owl, Elf Owl, Great Gray Owl, White-Faced, Long-Eared Owl, Short-Eared Owl, Northern Pygmy Owl, Northern Spotted Owl, Screech Owl, Tawny Owl, Australian Masked Owl, and Verreaux’s Eagle-Owl. No matter the species that speaks to your soul, having an owl carving from Clark the Carver of Carve Me A Bear! Chainsaw Carvings is perfect for your collection. If you or a loved one is particularly fond of owls and you are looking for a perfect gift for a special occasion, or just a token of your devotion, contact Carve Me A Bear! 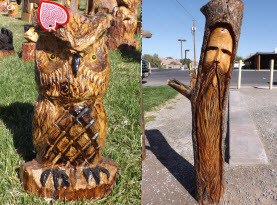 Chainsaw Carvings and choose from our inventory of owl carvings or put in your request for your custom owl carving today.